David is very much a kindred spirit; like me, he is constantly tweaking his go-gear. He works in New York City and likes to have his essentials with him there––radio included, of course. Since he’s a professional photographer, he never leaves home without the Lumix GF1 + Leica 20MM, very nice gear. 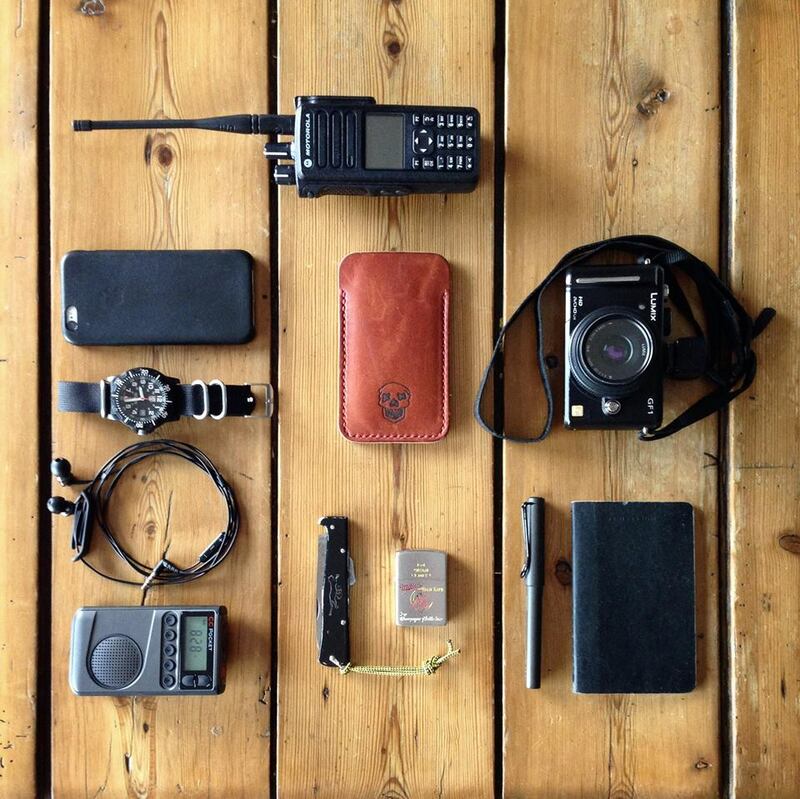 Since he’s a ham and an avid ARES guy, he carries a Motorola XPR7550 UHF transceiver. And since he’s a radio listener, he carries the CC Pocket AM/FM radio. True, he doesn’t have a shortwave radio in this kit, but he certainly takes his shortwave with him when traveling any further afield. Indeed, we once did some field work in Belize for ETOW and enjoyed a great SWLing session with the our Grundig G series receivers. Made for great comparison. Someday soon, I’ll take some photos of the kit that accompanies me most everywhere I go. In the meantime, we’d love to know what’s in your go-kit! If you have one, take a photo and add a few brief notes describing everything in it. I’ll post it here on the SWLing Post! This entry was posted in AM, FM, News, Portable Radio, Preparedness, Shortwave Radio and tagged David Korchin, David Korchin KC2WNW, Go Kit, Preparedness, Radio Preparedness, Urban Go Kit on April 23, 2015 by Thomas. Digital camera? Are they still being sold? Yeah, they’re very much still on the market. The cheaper point and shoots are much less relevant, but manufacturers are designing higher end compact cameras with performance that rivals DSLRs. There isn’t a smart phone on the planet that will match the performance of that Lumix GF1 with Leica lens. It’s a brilliant piece of kit. I use a simpler kit when I travel. In the past I have taken along a Grundig YB 400 with a wall plug in power supply and I take a set of wall adapters (available from places like REI ) to account for different voltage outlets in different countries. Lately the YB 400 has been replaced with a Tecsun Pl310ET with a USB charger that I can plug into my Netbook. My camera is a Panasonic Lumix LX3 which I like because of its wide angle and relatively fast lens. Also a windup antenna and a small pair of headphones. All of which can go onto the plane in a small day pack. Nice set up! The radio that I always have with me in my go pack is a micro/mini portable shortwave radio such as a PL-660 or smaller as I want more than just AM/FM/NOAA coverage, regardless of how far I go. If the SHTF and I am away from my QTH, I want to have a SW Radio always around, one with USB/LSB capacity is a bonus as I am not a ham. For my personal EDC purposes I carry an EDC keychain along with my Swiss knife even in an urban environment you just never know. Of course everyone has their opinion and needs are different. I sometimes find that I have too much and then end up cutting down on EDC gear. With all the sugestions on what to carry it is really hard to know what to have as there is so much that is recommended. Time will tell if I have what I need when I needd it. One glance at the shot and it was obvious it was done by a pro. Compliments, from one pro photographer to another. my needs are a bit different: My job includes a lot of traveling with my car. So a good mobile radio station is essential. I can switch my station to a different, unprepared car within half an hour. A 1 F/18 V capacitor (“power cap”) reduces the current needed by my FT-857 to about 5 A. That is low enough to power my shortwave station from the 12 V outlet in the trunk of my car. This might not work so good when the motor is off. but I mostly operate while driving. My monoband antennas are 1.5 to 1.7 m long and are quite happy on my mag mount. Add a common-mode yoke to the coax next to the mag mount EMI reasons and make sure that you have enough capacity to the roof of your car. A good mag mount might provide about 300 pF which is enough for 14 MHz and up. If you wish to go lower, get a magnetic mat, glue aluminium foil on the bottom side and connect the foil to the mag mound mass. 20×20 cm give you several nF. The biggest problem is how to mount the remote head of th FT-857. But in the age of navigation systems and cellphones solutions are quite easy to find. A small speaker like a Peiker KL-1 completes the station. Outside of my car I have a rucksack for a mobile office. An outsode pocket contains a Kenwood TH-79E handheld. This rig is 20 years old and quite big by today’s standards. But it has hat least two advantages compared to present rigs: It has a mechanical on/off switch, i.e. the battery is not depleted over time. And I can operate it with four AA cells. In my ruckack I always carry a few AA accumulators of the “pre-charged” type that I can use for other equipment, too. It happens that I do not need all this for a few months but it never happened that all my batteries were empty.